Recently I got an RX 460 to upgrade my old R7 250. R7 250 does not target gaming, but when I bought it back in 2015 it was a good upgrade from the onboard card. RX 460 is more than enough for my old machine date back from 2011. 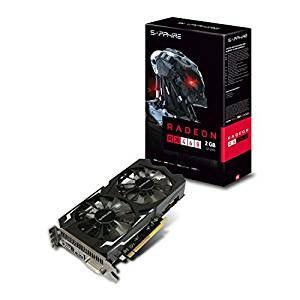 Thus, I ordered the SAPPHIRE RADEON RX 460 2GB. The card is powerful and well packaged. No external 6-pin power connector from PSU is necessary. PCI express is x8 (fewer lanes), but you are not going to see any significant difference. I have an old machine with G860 3.00GHz, so there is no point of installing anything stronger. I have a corsair PSU CX430 and the machine is more than enough. Power draw is 60-70W, but I have seen up to 80W draw. With overclocking, you will be able to win some 5-10% performance, but I suggest not to do it for a long term. The card has 2GB of memory. There is also a modified BIOS that you can unlock some of the locked hardware (if you try, first take a backup), but you will not able to install the latest AMD drivers due to BIOS check the signature. Most of the games I play (Company of Heroes, CS GO, Adventure games) don't require more. The only game I got some issues was Dreamfall chapters, where I had to decrease some of the options of the graphics because I was getting less than 30fps. Tested also monero (xmr) mining: got ~300 H/s and goes up to 320 H/s with overclocking. In contrast, with the GTX 750TI you get around 220 H/s. CS GO getting more than 80 fps. Most of the demanding games I 'm getting 40+fps, except these that are based on unity engine. Didn't test any DX12 or Vulkan games. Finally, seems hard (or even impossible) to install drivers in Ubuntu 14.04, suggesting to move it to 16.04. Good performance in most of the games in 1920x1080. Dual fan makes the card cool. Newest drivers from AMD are really good and improve the performance. Power less than 80W - no external connector. PCI-X x8, means you are losing a bit of performance (2-3%) in some games. 2GB is enough for now, but not for the future. Overclocking is limited due to no external power connector. No drivers out of the box for Ubuntu 14.04 LTS. Two weeks after, the card seems to work fine and plays all games without problems. Overall, if you need a medium power GPU or if you have an old machine, this card is the best choice especially if you find it for less than 120 Euro.